Waipahu Community Association is teaming up with Habilitat to help our community and raise money to further the Waipahu Community Association’s (WCA) mission of “building a stronger community”. We support and organize activities & programs that strengthens Waipahu’s social, economic, and cultural vitality. This unique project is one of Hawaii’s only true local fundraisers. The pendants began as trees that were already cut down here on the Island and then handcrafted at Habilitat. The items make great gifts for friends and family in the mainland. Parents, please share this wonderful opportunity with your family, friends, and co-workers. Simply fill out the information below, and the product will be distributed to you. For more information go to www.habilitat.com/fundraising so you can email your friends and family and they can mail in an order form and payment. 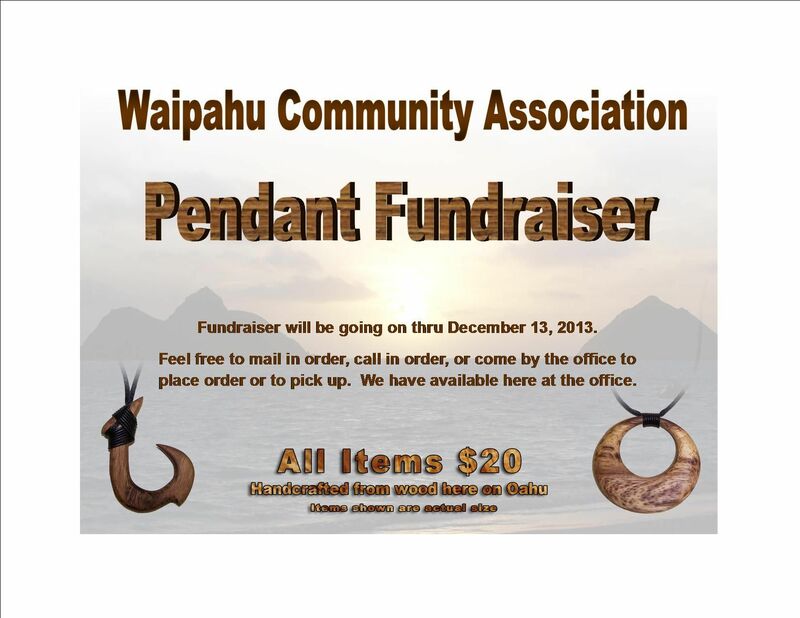 Mail to: 94-340 Waipahu Depot Street #201, Waipahu, HI 96797 Make checks payable to: Waipahu Community Association.